A business's confidential information may include information enabling others to solicit the business's customers, suppliers, contractor or employees, and thereby cause damage to the business. For this reason, you should consider including specific non-solicitation provisions in your non-disclosure or confidentiality agreement. 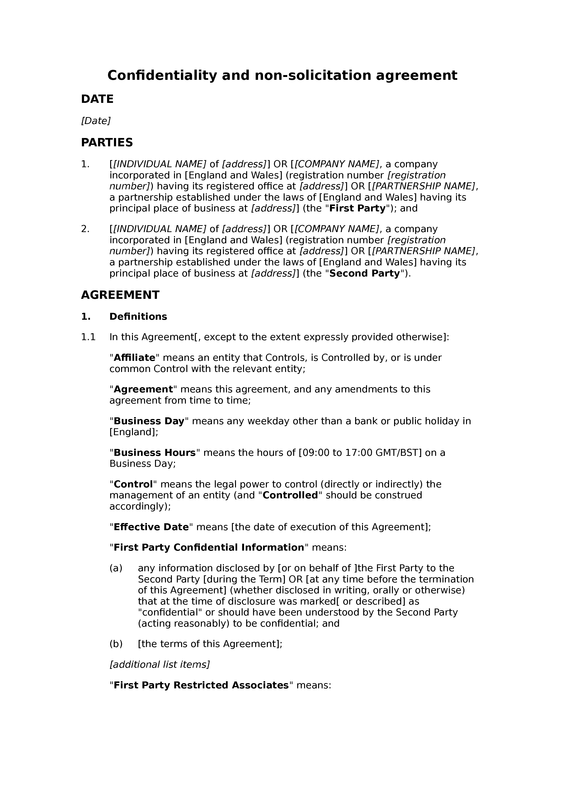 This is a unilateral (or one-way) template, and so it will only serve to protect the information and business relationships of one of the parties; you should consult the mutual (or two-way) version of this template that we publish if both parties' confidentiality interests need protecting. 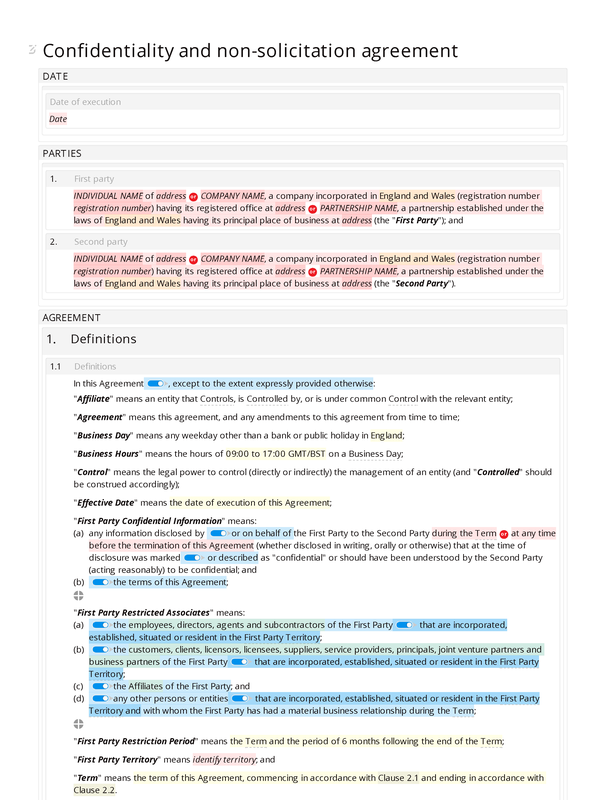 Because this is a unilateral template, a special "consideration" clause has been included to help ensure the basic requirements for an English law contract are met. The confidentiality provisions of this document are relatively flexible. 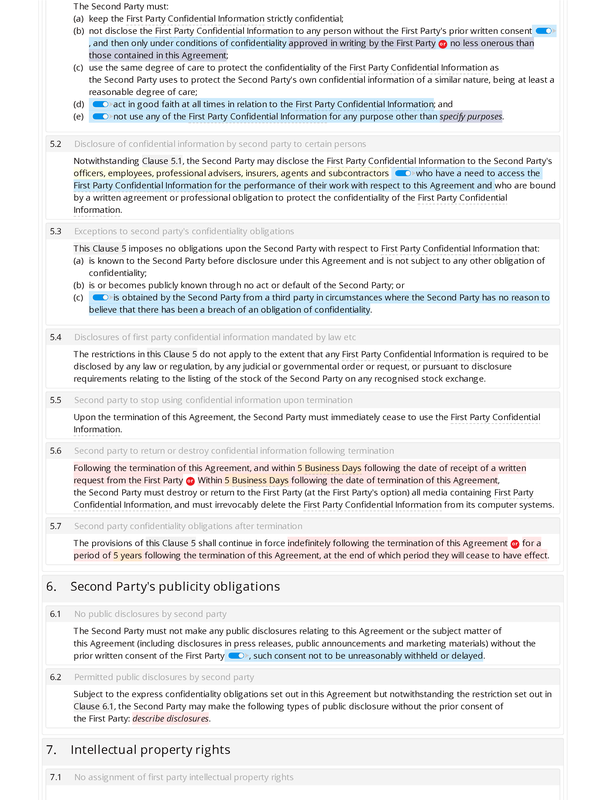 The definition of "confidential information" covers: (i) information that is marked as confidential; (ii) information that should have been understood by the recipient to be confidential; (iii) the terms of the agreement (optionally); and (iv) user-defined categories of information. 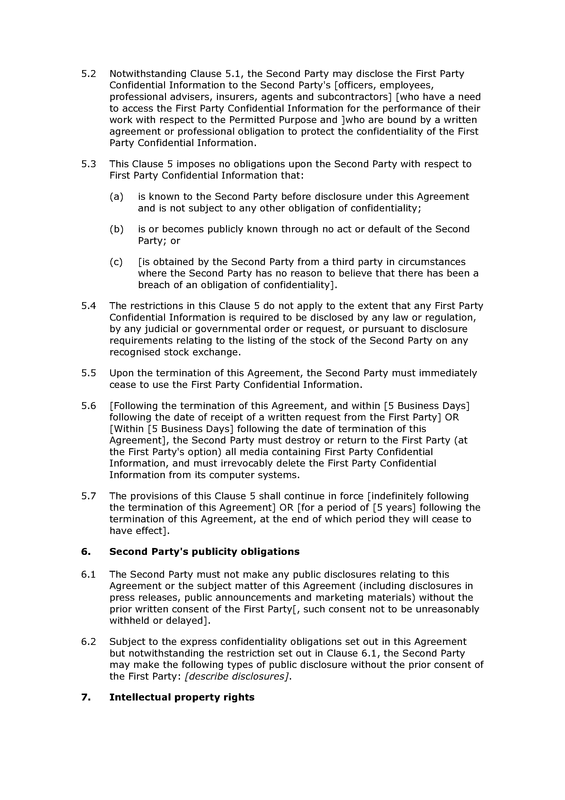 The second party must keep the information confidential, not disclose it to any person except as expressly permitted by the agreement, protect it with at least a reasonable degree of care, act in good faith in relation to the information, and (optionally) only use the information for some defined "permitted purpose". The usual exceptions to confidentiality obligations are included, such as disclosures required by law. Various optional and flexible provisions are included to deal with termination. 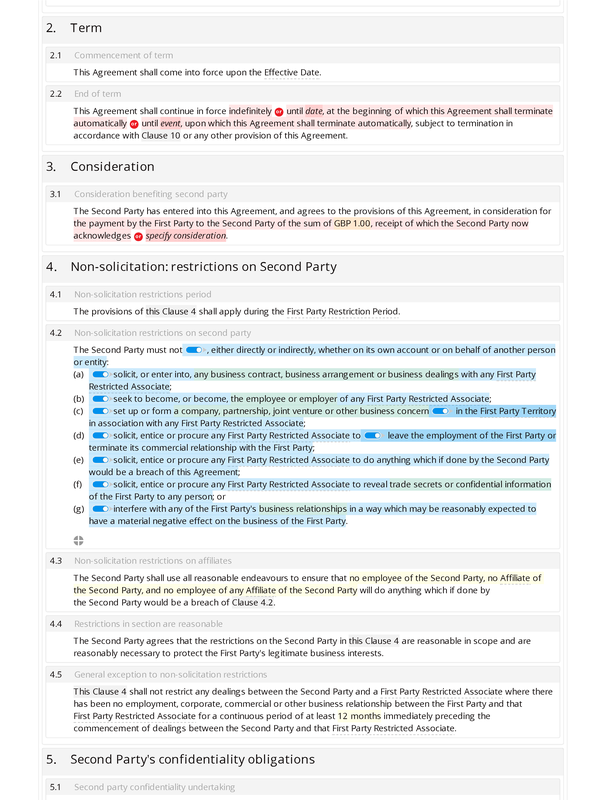 Following the termination of the agreement, the second party can be prohibited from using the confidential information further. The second party may also be required to return storage media containing information to the first party, or to destroy such media. The confidentiality obligations generally can be specified to continue indefinitely, or for some specific period after termination. Key concepts in the non-solicitation provisions are the "restricted associate" and the "restriction period". Restricted associates may include employees, directors, agents, subcontractors, customers, clients, licensors, licensees, suppliers, service providers, principals, joint venture partners, business partners, group companies, and so on. The period of restriction is defined as the term of the agreement plus an additional defined period (eg 6 months). The majority of the non-solicitation restrictions prohibit defined types of action in relation to restricted associates during the restriction period. 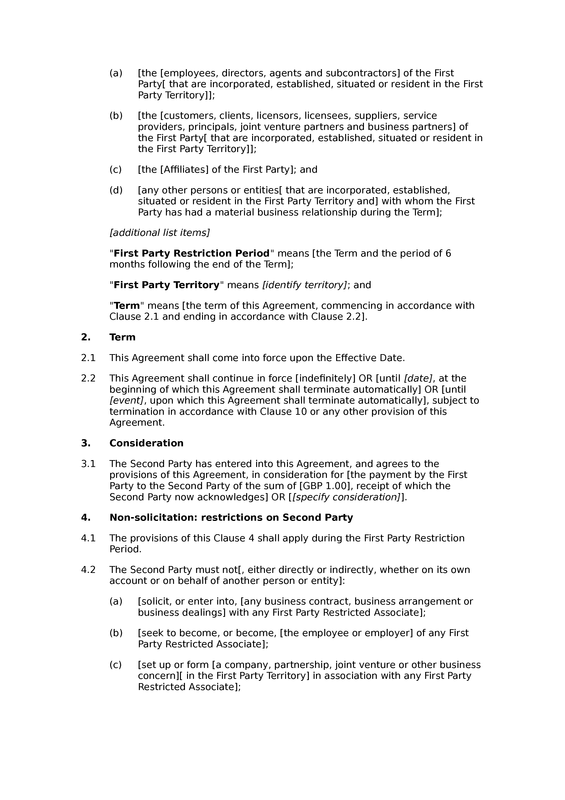 For instance, the second party may be prohibited from enticing any restricted associate to terminate a relationship with the first party. In addition, there is a more general restriction covering interference with business relationships. 's publicity obligations: no public disclosures by second party; permitted public disclosures by second party.